Here at Cherokee Truck Tires we believe good service will sell a tire, but good quality tires at a fair price will bring you back. As a member of the Cherokee Group we have a long history in the transportation industry dating back to 1974. Our first hand knowledge of the petro-chemical aggregate, agriculture and construction industries gives us at Cherokee the expertise to assess your tire application needs and recommend the right tire for the job. Our partnership with Sumitomo Tires and other manufacturing groups allows us to offer quality import tires at factory direct pricing. Whether it’s one tire or an entire container you need, we're here to serve your company's tire buying needs. We offer both retail and wholesale/container pricing. 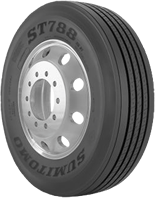 Tires can be picked up on will-call from our Sacramento warehouse or delivered to you. Both local and Nation wide delivery are available. Please call us for a delivery quote.